Gov. Tony Evers gives his first State of the State address on Jan. 22, 2019. Gov. Tony Evers backtracks on the ACA lawsuit withdrawal. WUWM's LaToya Dennis reports. Wisconsin Attorney General Josh Kaul said he will not withdraw from the federal, multi-state lawsuit against the Affordable Care Act. This comes after new Wisconsin Gov. Tony Evers made headlines Tuesday night during his State of the State address, saying he was directing Kaul to withdraw from the ACA lawsuit. But on Wednesday, the state’s non-partisan Legislative Reference Bureau said Evers could not make such a demand. Then, Evers changed his tune saying he didn’t order the attorney general to withdraw from the suit, after all. The Democratic governor got some of the loudest and longest applause during the State of the State speech when he said he’d ensure Wisconsin pulled out of the ACA lawsuit. In particular, he referred to the coverage for pre-existing conditions guaranteed under the Affordable Care Act. “I’ve said all along that I believe the best way to maintain protections for health care here in Wisconsin is to stop trying to dismantle those protections at the federal level,” Evers said. It was a bold move for the new governor because it flew in the face of the Republican-backed bill lawmakers debated the same day, to ensure health care coverage for people with pre-existing conditions. Assembly Speaker Robin Vos expressed frustration with Democrats for not going along with the Republican plan. “Trying to score political points constantly on the first day of the session rather than saying how can we work together, let’s figure out a way to pass pre-existing protections. They look for the most divisive thing they could find and that is the broken, unaffordable Obama Care to focus all of their energy in the first minutes of the debate,” Vos says. 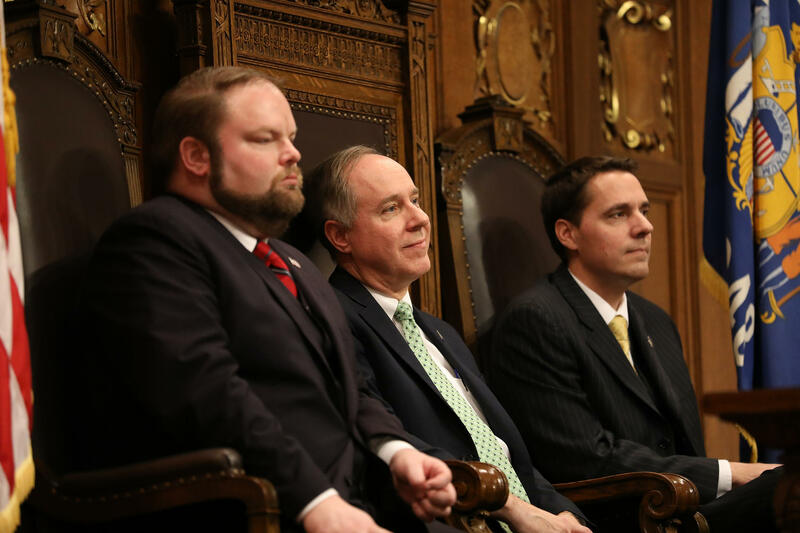 (From left) Speaker Pro Tempore Rep. Tyler August (R-Lake Geneva), Assembly Speaker Robin Vos (R-Rochester) and President of the Senate Roger Roth ( R-Appleton) during the Jan. 22, 2019, State of the State address. But what really made Evers’ State of the State speech announcement stand out was that the power to decide whether to pull out of the Affordable Care Act lawsuit lies with the state’s GOP-controlled Joint Finance Committee. That change was part of the lame-duck legislative bills Republican lawmakers approved last month to limit Evers’ powers. People who watched the State of the State speech wondered whether Evers was threatening to break the law, by ordering the attorney general to withdraw. Wednesday, Evers walked back his comments. His spokeswoman said Evers "has not directed the attorney general to take any specific course of action, he has simply withdrawn his authority for this lawsuit." But does it really matter whether Wisconsin continues fighting the Affordable Care Act? UW-Milwaukee professor emeritus Mordecai Lee says no. “If we’re talking about whether Wisconsin's gonna be the 20th state that’s supporting the repeal of Obama Care or if only 19 states will be left as friends of the court, I think that we should assume that this is relatively symbolic,” Lee says. In other words, Lee says the legal challenge would go on, even if Evers were somehow able to find a way to pull Wisconsin from the lawsuit. Lee says Evers’ desire to pull out of the lawsuit is more about taking a stand than having a real impact. By the way, the Republican measure to protect coverage for people with pre-existing conditions was approved in the Assembly Tuesday. It now heads to the state Senate. If approved there, the bill will head to Evers’ desk. Newly inaugurated Wisconsin Gov. Tony Evers Tony Evers used his first State of the State address to push his agenda on education, health care, transportation and the economy. He said the state has work to do and pointed out several areas that he wants the state to do better. Evers noted, for instance, that the health of a state’s economy is not only measured by its unemployment rate but also by the number of people who work forty hours each week and are still in poverty. New Gov. Tony Evers is expected to outline portions of his agenda Tuesday night when he delivers his first State of the State address. Observers are eager to hear what the Democrat will say. UW-Milwaukee professor emeritus Mordecai Lee predicts the speech won't be very flashy. Rather, Lee says that Evers is likely to push the issues that he championed during his campaign. Gov. Tony Evers has been making a series of stops around the state, focusing on topics that were part of his campaign. Monday he was in Milwaukee, where he talked up workforce development and entrepreneurship. The governor's first stop was at the Wisconsin Regional Training Program/Bigstep organization located on 38th Street and Wisconsin Avenue.